Internal variability can only account for ~0.3°C change in average global surface air temperature at most over periods of several decades, and scientific studies have consistently shown that it cannot account for more than a small fraction of the global warming over the past century. A favorite argument among climate scientist "skeptics" like Christy, Spencer, and Lindzen is that "internal variability" can account for much or all of the global warming we've observed over the past century. As we will see here, natural variability cannot account for the large and rapid warming we've observed over the past century, and particularly the past 40 years. One of the most widely-circulated papers on the impact of natural variability on global temperatures is Swanson et al. (2009) which John has previously discussed. In their paper, Swanson et al. use climate models to hash out the role internal variability has played in average global temperature changes over the past century (Figure 1). As you can see, over periods of a few decades, modeled internal variability does not cause surface temperatures to change by more than 0.3°C, and over longer periods, such as the entire 20th Century, its transient warming and cooling influences tend to average out, and internal variability does not cause long-term temperature trends. While Huber and Knutti find that internal variability could account for as much as ~0.15°C warming since 1950, it could also account for ~0.15°C cooling, or anything in between. What the authors have concluded is that natural variability can very likely account for no more than 26% of the warming since 1950, and no more than 18% since 1850 (and in both cases, the most likely value is close to zero). "The amplitude and time scale of the IMP [internal multidecadal pattern] are such that its contribution to the trend dominates that of the forced component on time scales shorter than 16 yr, implying that the lack of warming trend during the past 10 yr is not statistically significant...While the IMP can contribute significantly to trends for periods of 30 yr or shorter, it cannot account for the 0.8°C warming that has been observed in the twentieth-century spatially averaged SST." "throughout the simulated time series no temperature change as large as 0.5°C per century is sustained for more than a few decades. Assuming that the model is realistic, these results suggest that the observed trend is not a natural feature of the interaction between the atmosphere and oceans." "Simulations with a simple climate model are used to determine the main controls on internally generated low-frequency variability, and show that natural trends of up to 0.3°C may occur over intervals of up to 100 years. Although the magnitude of such trends is unexpectedly large, it is insufficient to explain the observed global warming during the twentieth century." These studies are also consistent with Bertrand and van Ypersele (2002), Rybski et al. (2006), and Zorita et al. (2008), among others. There is a strong consensus that natural variability cannot account for the observed global warming trend. Dr. Roy Spencer has proposed a hypothesis whereby some unknown internal mechanism causes cloud cover to change, which in turn changes the reflectivity (albedo) of the planet, thus causing warming or cooling. Spencer also attributes most of the global warming over the past century to this "internal radiative forcing." There are some significant flaws in this hypothesis. For one thing, it fails to explain many of the observed "fingerprints" of human-caused global warming, such as the cooling upper atmosphere (stratosphere and above) and the higher rate of warming at night than during the day. In order for internal variability to account for the global warming over the past century (especially over the past 40 years), it requires that the large greenhouse gas radiative forcing can't have much effect on global temperatures. For this to be true, climate sensitivity must be low. But as discussed in Swanson et al. (2009), if climate is more sensitive to internal variability than currently thought, this would also mean climate is more sensitive to external forcings, including CO2. This is a Catch-22 for Spencer's hypothesis; it effectively requires that climate sensitivity is simultaneously both low and high. "My cloud feedback calculation is supported by a firm causal link: ENSO causes surface temperature variations which causes cloud changes. This is supported by the iron triangle of observations, theory, and climate models." Dessler published a second study Dessler (2011), examining whether observational data behaved as expected by Spencer's internal variability hypothesis. Spencer & Braswell (2011) assumed that the change in top of the atmosphere (TOA) energy flux due to cloud cover changes from 2000 to 2010 was twice as large as the heating of the climate system through ocean circulation. Dessler (2011) used observational data (such as surface temperature measurements and ARGO ocean temperature) to estimate and corroborate these values, and found that the heating of the climate system through ocean heat transport was 20 times larger than TOA energy flux changes due to cloud cover over the period in question. This empirical finding contradicts Spencer's hypothesis that cloud cover changes are driving global warming, but is consistent with our current understanding of the climate: ocean heat is exchanged with the atmosphere, which causes surface warming, which alters atmospheric circulation, which alters cloud cover, which impacts surface temperature. However, while Spencer hypothesizes that the changes in cloud cover are the main driver behind global warming, Dessler concludes that they're only responsible for a small percentage of the changes in surface temperature from 2000 to 2010. "For 1950–1998, ENSO linearly accounts for 0.06°C of global surface temperature increase." This 0.06°C accounts for approximately 12% of the warming trend over the timeframe in question. Foster et al. (2010) also examined the effects of ENSO on global temperature and arrived at the same conclusion. "It has been well known for many years that ENSO is associated with significant variability in global mean temperatures on interannual timescales. However, this relationship (which, contrary to the claim of MFC09, is simulated by global climate models, e.g. Santer et al. ) 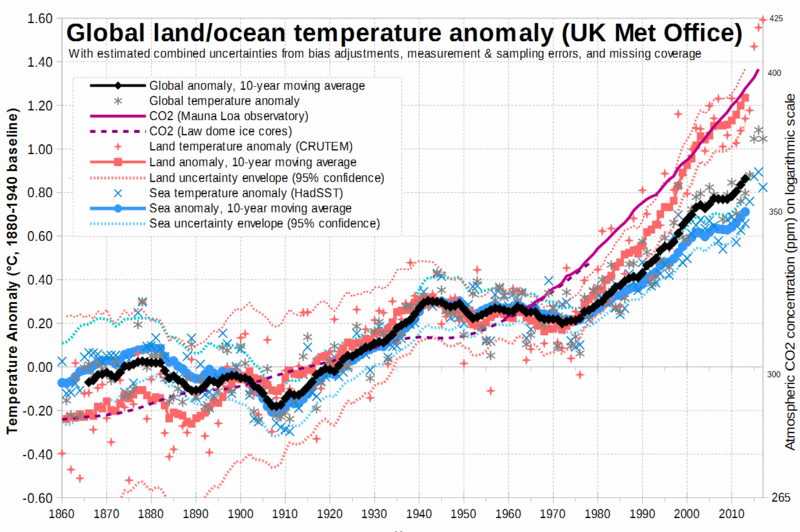 cannot explain temperature trends on decadal and longer time scales." "In all of these previous analyses, ENSO has been found to describe between 15 and 30% of the interseasonal and longer-term variability in surface and/or lower tropospheric temperature, but little of the global mean warming trend of the past half century." "The evidence presented here suggests that most of that warming might well have been caused by cloud changes associated with a natural mode of climate variability: the Pacific Decadal Oscillation." "Spencer's curve-fitting enterprise could (and did!) give him essentially any answer he wanted, as long as he didn't mind using parameters that don't make any physical sense." Further, as we have previously discussed, like ENSO, PDO physically cannot cause a long-term global warming trend. It is an oscillation which simply moves heat from oceans to air and vice-versa, so even if there were a period of predominantly positive PDO over the long-term, the oceans would cool as a consequence of the transfer of heat to the overlying air. That is not the case: the oceans are warming as well. In conclusion, there is simply no supporting evidence or physics behind the claim that the global warming over the past century could simply be attributed to internal variability. Studies on the subject consistently show that internal variability does not account for more than ~0.3°C warming of global surface air temperatures over periods of several decades. Internal variability also tends to average out over longer periods of time, as has been the case over the past century, and cannot account for more than a small fraction of the observed warming over that period. Spencer's hypothesis cannot account for numerous observed changes in the global climate (which are consistent with an increased greenhouse effect), does not have a known physical mechanism, and there are simply better explanations for interactions between global temperature and cloud cover. even if there were a period of predominantly positive PDO over the long-term, the oceans would cool as a consequence of the transfer of heat to the overlying air. That is not the case: the oceans are warming as well. The image must be no wider than 450 pixels. This guidance is shown at the bottom of the Comments Policy. Dear webmaster, wowzers, I think the CSS needs tweaking to keep image widths under control. And this rebuttal could be improved by explaining what natural internal variability means. Something involving the law of conservation of energy - internal variability cannot create heat magically, it has to come from somewhere. [JH] Commenters are responsible for keeping the widths of the graphics they insert into a comment to 450 pixels or less. Please do so in the future. [BW] Regarding the definition of "internal variability" (and many other terms): we actually have an active glossary based on the AR4 definitions which pop-up in the right-hand margin of the screen when you hover the cursor over a thinly underlined term. The glossary's functionality is described here.